DNSCrypt Proxy 2 is a flexible DNS proxy with support for encrypted DNS protocols, like DNSCrypt v2 and DNS-over-HTTPS. DNSCrypt is a network protocol which authenticates and encrypts Domain Name System (DNS) traffic between the user's computer and recursive name servers. It turns regular DNS traffic into encrypted DNS traffic that's protected from spying, spoofing, or man-in-the-middle attacks, thus improving the user's online security and privacy. You can check out the complete DNSCrypt Proxy v2 feature list by visiting the project page. Compared to v1, the 2.0 series of DNSCrypt Proxy, which had its first stable release back in February, was rewritten in Go, has support for DNS-over-TLS and DNS-over-HTTP, and it supports DNS caching. It also has a new configuration file format that's not compatible with the old v1. DNSCrypt Proxy v2 is available in the Debian Testing and Unstable repositories, as well as the Ubuntu 18.10 repositories. There's also a PPA for Ubuntu 18.04 and Linux Mint 19. The PPA has packages for older Ubuntu / Linux Mint versions but I couldn't get it to work, so this article offers instructions only for Ubuntu 18.04, Ubuntu 18.10, Linux Mint 19, Debian Unstable and Debian Testing. As a side note, for Windows users there's a simple management tool for DNSCrypt Proxy, called Simple DNSCrypt. Ubuntu 18.10 is the first Ubuntu release to have the new DNSCrypt Proxy 2 in its archive. The package was imported from Debian and thus, is also available in Debian Unstable and Testing. To use DNSCrypt Proxy 2, change the DNS to 127.0.2.1 in your network configuration. How to change this depends on the desktop environment you're using. For WiFi, go to System Settings > WiFi instead. Remember to restart the WiFi network to use the new DNS. DNSCrypt Proxy v2 didn't make it into the Ubuntu 18.04 archive, but it has an official PPA you can use to install it and receive future updates. The PPA is compatible with Ubuntu 18.04, Ubuntu 16.04, Linux Mint 19.x and Linux Mint 18.x., but I didn't have much success getting DNSCrypt Proxy 2 from this PPA to work in Ubuntu 16.04 or Linux Mint 18. So the instructions below are for Ubuntu 18.04 and Linux Mint 19.x only. Now you'll need to change your DNS server to 127.0.2.1 in your network settings. How to change this depends on the desktop environment you're using. 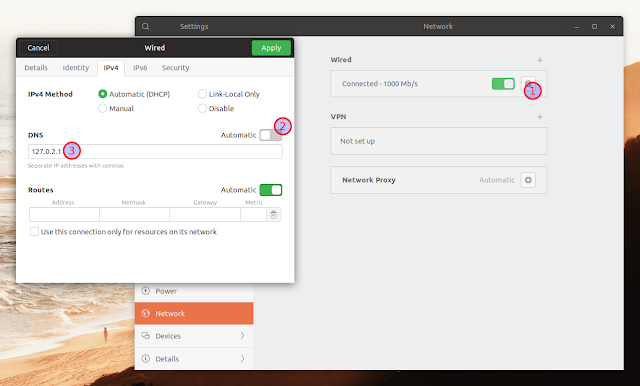 For WiFi networks, go to System Settings > WiFi instead. Remember to restart the WiFi network to use the new DNS. There are multiple ways of checking if you're using DNSCrypt Proxy and which is the current DNS you're using. Use the first one below to find out if DNSCrypt Proxy actually works on your system and the other two if you want to check what is the DNS in use on your computer (all can be used to also check if you're using DNSCrypt Proxy, but the first one is the most reliable). I. The best way to check if you're using DNSCrypt Proxy is to stop the service. Since it's stopped, DNS resolution should not work any more, confirming that DNSCrypt Proxy is actually in use when the service is running. III. You can find your current DNS resolver by using a DNS Leak tester website. There are quite a few websites for this available, like Perfect Privacy, DNS Leak Test, the DNS Leak Test of ExpressVPN , ipleak.net and so on. Using its default configuration, DNSCrypt Proxy 2 automatically picks the fastest working servers from the public servers list, which match the filters set up in the DNSCrypt Proxy 2 configuration file. This is the case for the packages from the DNSCrypt Proxy 2 PPA, but not for the package available in the Ubuntu 18.10 repositories. In Ubuntu 18.10, DNSCrypt Proxy 2 defaults to the CloudFlare DNS. Replace gedit with the graphical text editor of your choice (like xed, which is the default text editor in Linux Mint Cinnamon, etc.). Next, in this file uncomment the server_names line if it's commented out (it should be near the top - it's commented out for the PPA packages; uncommenting this line means to remove the # sign from the beginning of the line, if it's present). All the DNSCrypt Proxy 2 options can be changed by editing the /etc/dnscrypt-proxy/dnscrypt-proxy.toml configuration file. If you're using the PPA package, all the DNSCrypt Proxy 2 configuration options are already available in the /etc/dnscrypt-proxy/dnscrypt-proxy.toml file. In case of Ubuntu 18.10 and Debian Testing and Unstable, the DNSCrypt Proxy 2 package that's available in the repositories ships with a simplified configuration file, which only has a few options listed. You can find the original dnscrypt-proxy.toml on GitHub though. 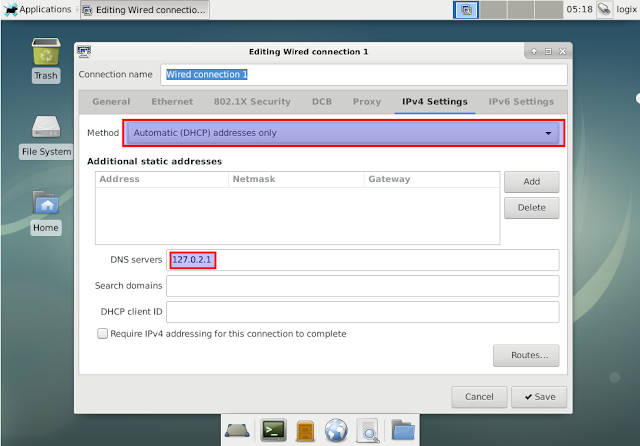 Copy the options you want to use (and uncomment them) in your /etc/dnscrypt-proxy/dnscrypt-proxy.toml. Don't change the listen_addresses value though (leave it empty) as it may cause DNSCrypt Proxy 2 to stop working. 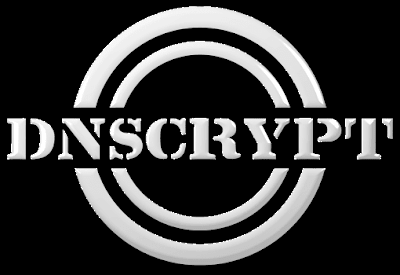 If you must change the DNSCrypt Proxy 2 listen address (defaulting to 127.0.2.1 in Debian and Ubuntu), do so by editing the dnscrypt-proxy.socket file.